At Vail our lessons aren’t just for beginners learning art of the Pizza Vs. French Fries. We believe in being life-long learners, and we take that belief to the slopes. With offerings like our Max 3 Lesson and our terrain based learning approach, you can perfect your technique, become a master mountaineer and conquer all the terrain Vail has to offer. 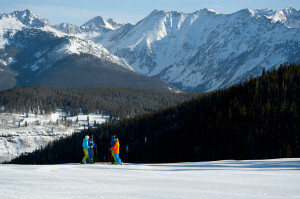 Our Max 3 experiential lesson is considered to be the Masters Degree of skiing. Even the most experienced skiers will walk away from this day on the hill feeling more well versed skiing on all types of terrain, reading conditions, learning about their gear and how to combine their knowledge to have an incredible experience on the hill, no matter what the conditions are! Available to intermediate and advanced athletes, Max 3 Lessons taught by expert skiers will take you around the mountain to experience Vail in a way you never have before. Learn expert tactics and how to go everywhere on the mountain – not only with confidence, but with style! Vail prides itself on its wide range of terrain, from our miles of clean, crisp corduroy, to formidable moguls, to the expansive and awe-inspiring back bowls. It takes a talented skier to master all of our terrain. After this guided mountain experience you will not only have the best ski day of your life, you’ll be shaped into an all-mountain-skier! Are you a die-hard steeps lover that avoids the bumps? The small, intimate environment of the Max 3 experience will allow you to work with your own expert guide and your small group to learn what you want, and not what you don’t. Our Max 3 lessons guarantee you won’t have more than a chairlift of people in your group. No more waiting on big group lessons or people with differing abilities. We pair up our Max 3 groups to ensure that you end up in a group with skiers of a similar ability and focus. You’ll get the most out of your day and be able to skip the lift lines when you ski with a Max 3 instructor. Still want to take your skiing to the next level but not quite ready for the Max 3 terrain based mountain tour? We offer a more structured Max 3 lesson that focuses heavily on building skills and confidence, while still offering participants the chance to experience the mountain in a whole new light. Max 3 even offers a ladies-specific lesson, Women and Wine Friday Afternoon Club, where women can build their ski skills in a customized, small group setting. And the best part of Women and Wine: it concludes with an Après-ski glass of wine!